The C6 Corvette just went out of production and along the way there were a number of special editions and different models. This particular one celebrates the career of Canadian race car driver Ron Fellows. Fellows joined the Pratt & Miller Corvette race team at its inception in 1998/9. He won the 24 Hours of Daytona in a C5-R in 2001. He has two class victories and seven podiums in C5-Rs and C6.Rs at the 24 Hours of Le Mans between 2000 and 2008. He was the most solid, reliable, and winning Corvette team driver of all time. He was also (perhaps never officially), the team leader. In 2007, he stepped into a supporting role at team Corvette, retiring for good in 2009. He still competes in the occasional NASCAR road-course race. 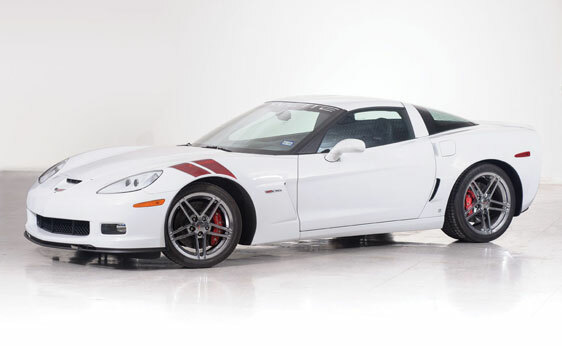 So Chevrolet honored his loyalty and passion with a limited-edition run of 399 Corvette Z06s. All came in Arctic White with a red fender stripe and Fellows’ autograph. This one, car #399 of 399, is actually signed by Ron inside. It uses the same 505 horsepower 7.0-liter V-8 as every other Z06. This one has less than 150 miles on it. It’s a $60,000-$75,000 car. Click here for more info and here for the rest of Auctions America’s Ft. Lauderdale auction lineup. This entry was posted in Uncategorized and tagged 2007, auctions, auctions america, cars, chevrolet, corvette, ron fellows, special edition, sports cars, z06 by ClassicCarWeekly. Bookmark the permalink.